When people talk about vinyl siding profiles, they are referring to the way the long narrow planks or panels look. Some are wide, some are narrow, some have groves cut into them, some don't. Some are rough like fresh cut cedar logs and some are very smooth like freshly painted sanded wooden planks. This is the 'Profile' of the siding. There are several different types, here are some of the more popular styles. 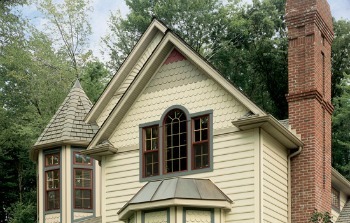 Shown here is Kaycan Vinyl siding profiles, Dutch Lap, Clapboard and Beaded profiles. Profile is the amount of panel that you see. 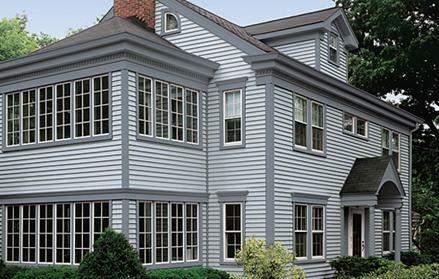 Here is CertainTeed Clapboard Vinyl Siding Profiles. Triple 3" Three profiles each 3" wide, hence the name Triple 3. Double 4" Two 4" profiles each 4" wide. Double 5" Two 5" profiles each 5" wide. Double 4" Dutch Lap Two 4" panels. Double 5" Dutch Lap Two 5" panels. Smooth Lap 7" One 7" wide smooth panel. Single 6 1/2" Beaded One 6 1/2 " panel. 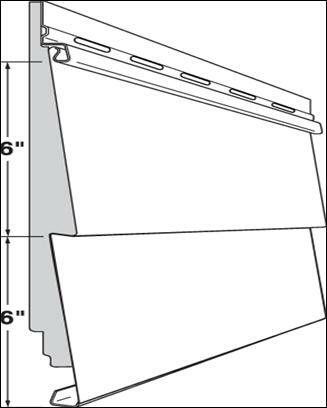 If you are looking at a Clapboard, Double 6", that means that each panel that you see is 6". A Double 4" would be 4" for each panel. Most clapboard styles come in a variety of different panel widths. 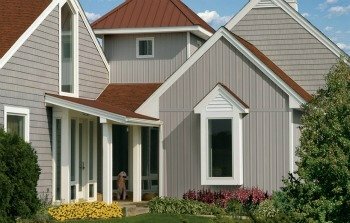 Making it easy to find a siding that will allow you to create most any style on your house. To see pictures of different architectural home styles using vinyl siding click here. 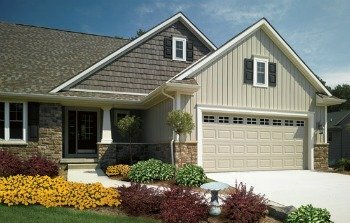 Whether your house is Craftsman style or Cape Cod style there is a vinyl siding that is right for you. 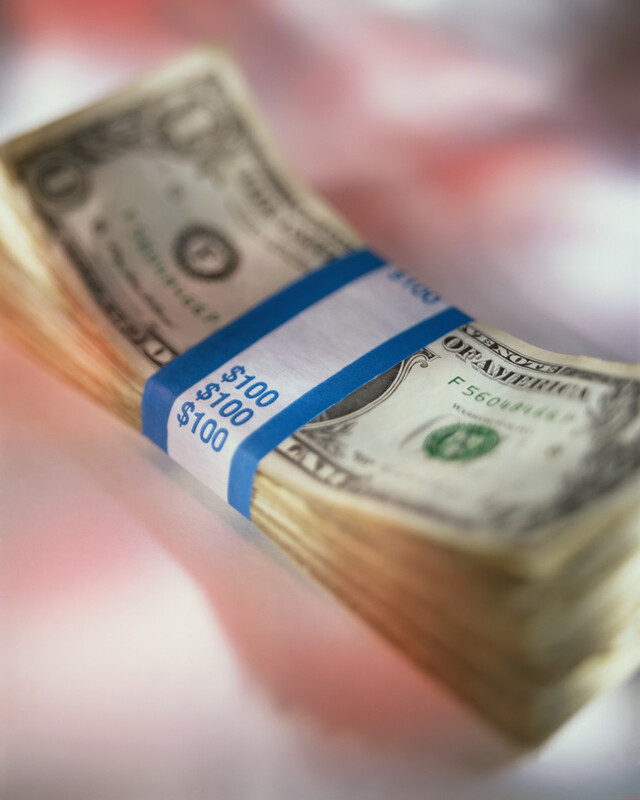 Want to review vinyl siding pricing? Click here. 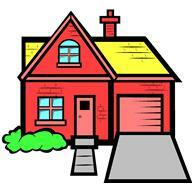 Like to look at more vinyl siding styles? Click here. Board and Batten or vertical siding is one of the oldest and most popular types of siding. All the boards run up and down. Board and Batten Siding is a type of siding where long wooden boards are installed top to bottom of the house or 'vertically'. Where the boards come together a small several inch wooden 'batten' is nailed over the crack between the two boards. Hence the name, 'board and batten'. In Colonial times this siding method made the homes more tight and helped kept out the harsh winter weather. Also use on barns all over America. It was so common on barns that it is still sometimes called 'Barn Siding'. Today this same Colonial look is reproduced using vinyl. Board and batten vinyl siding looks just like real wood but at half the cost. And it never needs painting, will not rot, and termites can't eat it. Board and batten siding is used here on the front of the garage. Note siding is running up and down or vertically. Also note homeowner used a different type of siding, cedar shake, on the gable of the main house. Vinyl allows you to mix and match different types, styles, colors and textures to create any look you want. Click here to see more about board and batten vinyl siding. Vinyl cedar shake siding looks the part. It is made using real cedar wood as a template to reproduce exactly the rich texture of fresh cut cedar. Used for centuries as the siding of choice for those who could afford it. Since each shingle was hand cut, it was very labor intensive and therefore more expensive than regular plank siding. 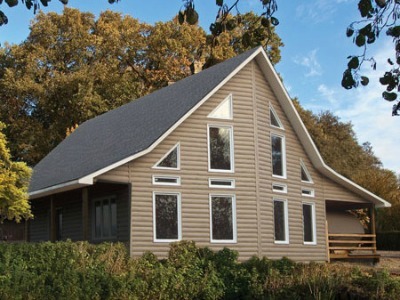 Click here to see more on Vinyl Cedar Shake Siding. 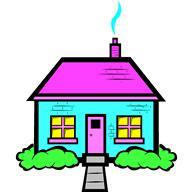 Back to Vinyl Siding Styles page click here. 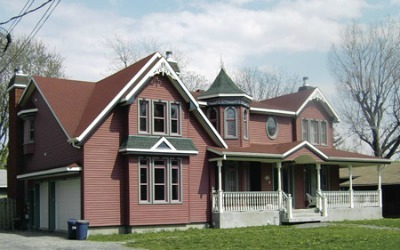 Shown here is CertainTeed Cedar Shake siding. Shown here are some of the more popular Cedar Shake Profiles from CertainTeed. Straight Edge Cedar Shake Profile. Note the bottom edges are straight across. Staggered Edge Cedar Shake Profile. Note the bottom edges are staggered giving it a more rustic look. 'Half-Rounds'. They are used as trim. Comes in many colors, textures and styles. Here the homeowner used three different color half-rounds on the gable. Mastic vinyl siding is one of the most popular sidings. 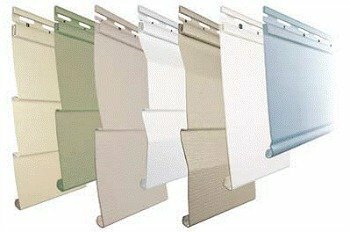 Mastic siding has been around for many years and is a leader in home siding products. Below are some of the different profiles they offer. 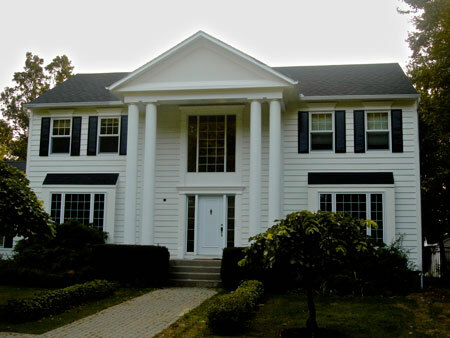 To see more Mastic siding profiles and pictures of homes using Mastic vinyl siding click here. Kaycan Vinyl Siding products. 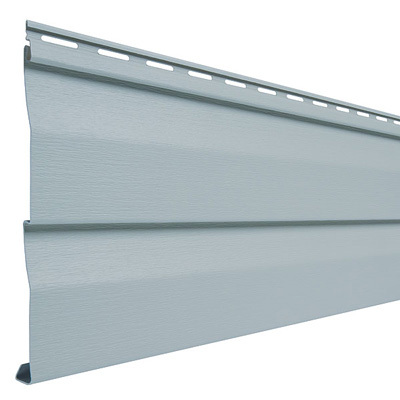 Kaycan is a manufacturer of high quality vinyl siding. Shown here are some of their different vinyl siding profile styles. Beaded Style Siding: Note bead running across the bottom edge. This adds a shadow line and adds flair to the look. The bead was hand cut in early America and took a lot more labor to make. So it was considered a higher end siding. 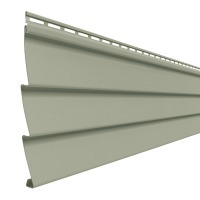 Dutch Lap Siding has a distinctive notch across the top edge. This gives the Dutch lap style a shadow line. One of the most popular profiles. Comes in several different profile heights. Rustic look of turn of the century, only more modern. And you never have to paint. Vinyl Cedar Log Siding Profile: Recreates the rustic look of cedar logs. The ideal look for the country home. And you don't have to cut down any trees! It comes insulated to help keep the winter cold out and insects won't eat it. Clapboard Smooth Panel: Looks like real cedar planks sanded and freshly painted. Comes in smooth finish or textured with cedar grain imprinted into the siding. See how the homeowner has mixed and matched different vinyl siding profiles to create this look. CertainTeed Clapboard style, Cedar Shake on the gables and natural stone to create a rugged natural outdoor look with a touch of sophistication. Mixing and matching different colors, textures and styles makes it easy for you to create any look. Here again the homeowner has used two different vinyl siding profiles, board and batten and cedar shake working together to complete the look they want. Click here to see more vinyl siding styles. Click here to see more about vinyl siding prices. Back to Home Page All About Siding. 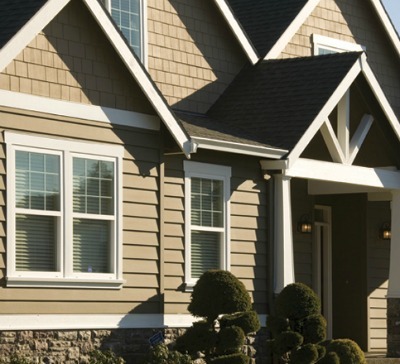 Hardie Board is one of the most popular types of home siding today. Much stronger than vinyl siding it is a excellent alternative to both real wood and vinyl siding. It comes in all popular styles, many different colors and factory primed for custom coloring.